Ohio – Healthcare workers at hospitals may be contaminating their hands and skin during removal of protective gowns and gloves, according to a report published Monday in JAMA Internal Medicine. 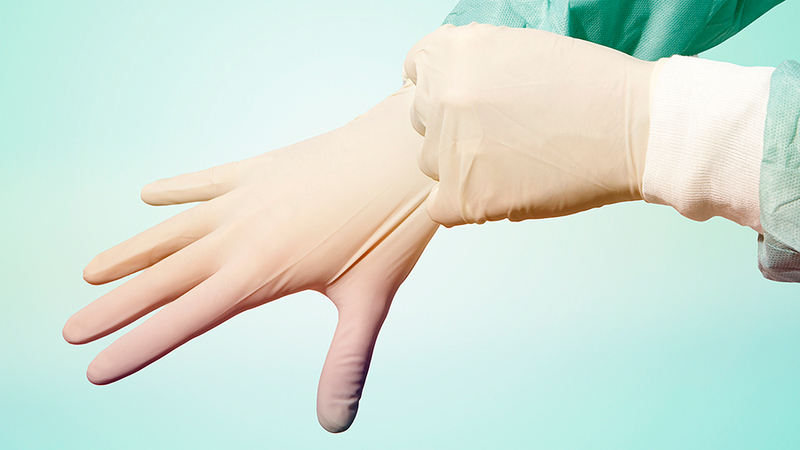 Researchers began by recruiting 435 staff members from four Ohio hospitals between October 2014 and March 2015 to find the potential for contamination while changing out used gloves and gowns. After asking participants to put on gloves and gowns, they were given fluorescent lotion and asked to rub it on their gloved hands, and then they were asked to remove the gloves. The fake bacteria in the lotion wound up on their skin or clothes on 46% of the time. Among the four hospitals, the possibility of contaminating themselves was about equal, with rates ranging from 42.5 percent to 50.3 percent. When the participants made a mistake, they were contaminated 70 percent of the time, but even when they did everything correctly, participants were contaminated 30 percent of the time. Improper usage of gloves accounted for 52.9 percent of the times with the most common mistakes being failure to pull gloves over the wrist, taking gowns off over the head (instead of pulling them away from the body), putting on gloves before the gown and touching the outside of a dirty glove when taking it off. Rates were also indistinctive to job occupation, of 435 simulations performed in the study, 246 were done by nurses, 72 by doctors and 117 by folks like phlebotomists, physical therapists, dietitians and radiology technicians. “These results have clear implications for the safety of health care workers and the spread of hospital-acquired infections,” researchers wrote in a commentary published in JAMA Internal Medicine with the study. With the report, began an intervention to retrain staff in proper usage of personal protective equipment over the course of one to three months. It resulted in a decrease of contamination rates, from 60 percent to 18.9 percent, but not the total elimination of the contamination.